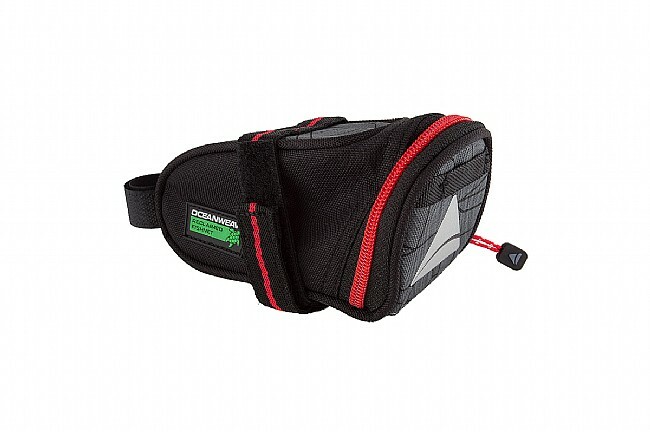 The Axiom Seymour Oceanweave Wedge is a lightweight, durable 0.5 L saddle bag designed to carry ride essentials. Constructed using Axiom's Oceanweave 600D recycled fishnet polyester, the Seymour is not only helping to store away riding essentials, it helps to clean up the environment. Featuring the same durability and performance that fishnets have when they're new, the Oceanweave fabric doesn't force a decision between high-quality, durable fabrics and being eco-conscious. The Seymour bag is finished with a polyurethane waterproof coating, helping to keep the elements out so your cards, cash, or other riding essentials stay safely dry all ride long. Also available in a 1.3L version. Constructed from reclaimed, recycled fishnet polyester and finished with a polyurethane waterproof treatment.